Business Point is responsive multipurpose business theme. It can be used for business, corporate, portfolio, digital agency, landing page, blog, entertainment and all informative websites. It is ultimate flexible with loads of nice options and features. We have applied our best experience so that you can create high-‘quality websites for business companies of any scale using this theme. Extract business-point.zip and upload the folder. Go to posts and delete ‘Hello World’ post or add featured image to it. Install ‘Mailchimp for WordPress’ and ‘Contact Form 7’ plugins and replace their shortcodes. – Site Icon is the option to add favicon of website. It is recommended to use square image for favicon. You can change the background of the site with this option. You can upload image from your computer or select from images available on media library. Once you select image for background, you will find few options like preset, image position, image size and more. Set as per your requirement. Each options are described in details below. Show Top Header option allow you to show or hide top header bar. Other options will be visible only if Show Top Header is enabled. This section includes Left Sidebar, Right Sidebar & No Sidebar. You can manage excerpt length of posts from here. This option allow you to change copyright text on footer of the site. This section includes option to enable or disable breadcrumb. This option allow you to control status and options of slider. It has 3 sub sections: Slider On/Off, Slider Effects Settings and Slider Elements On/Off. 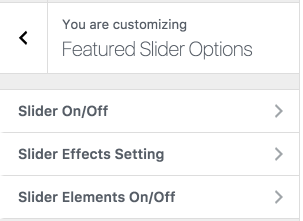 This option allow you to enable or disable slider and select slider pages for 5 different slides. To enable slider, select ‘Enable Slider’ check box. Once this option is selected 5 dropdowns will appear for slides to assign page for respective slider item. Note: Pages selected for slider need to have featured image assigned else it will not appear on slider. This option allow you to change settings of slide like transition effects, slide delay and duration of slide. Use all the available options on this section as per your requirement. This option allow you to show or hide different elements of slide like caption, arrows, dots(pager), button, overlay and more. This menu will appear on top header of the site. This menu will appear on Main menu for the site, right of the main logo. Set the menu on the Primary Header. 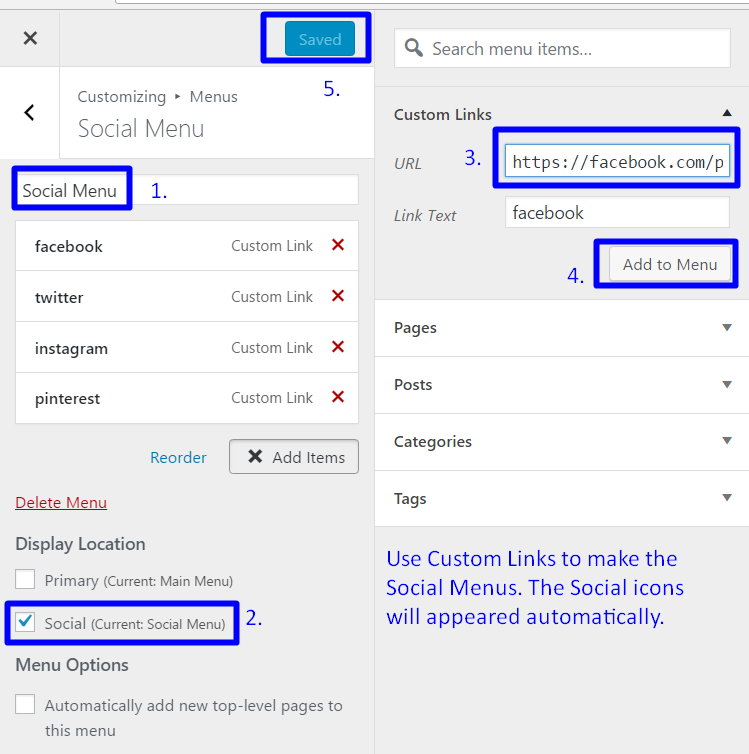 Add the menu and follow the same steps for other social links like twitter, Instagram, etc. You can drag and drop different widgets here but it is recommended to use Business Point widgets only on this area. Business Point widgets are prefixed with BP: followed by widget name. Go to Appearance > Customize > Widgets, you can see the footer options. There are four footer options i.e. footer1, footer2, footer3, footer4. 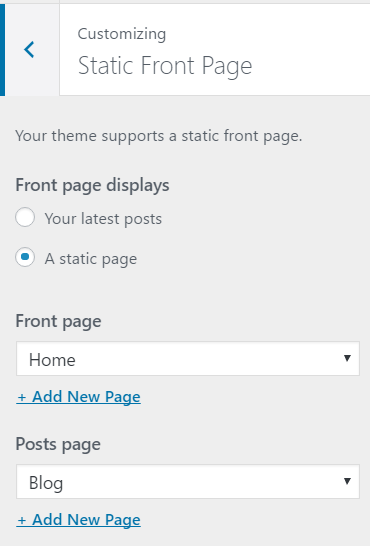 With the help of this widget, you can maintain the home page section with title, content, two different buttons and links. CTA Page: Select the page to show the information for Call to Action. Content of this page will be used for CTA section information. Button Texts: Add your own text for primary and secondary CTA buttons. Leave field empty if you wish to hide these buttons. Button URLs: Your own url for primary and secondary buttons goes there. Background Image: If image added here it will be used as parallax background of this section. Title: Title for the news/blog section. Icon: Icon used below title. You can use font-awesome class for icons. Leave empty if you wish to hide icon. Sub Title: For short description of section. Leave empty if you wish to hide sub-title. Exclude Categories: If you want to exclude posts from any category, you can use this option. Please provide ID of category you wish to exclude. Multiple categories can be used separated with comma. Hide Posted Date: Use it if you wish to hide posted date of article in home page. This widget is useful to add newsletter section on home page. Title: Title for the newsletter section. Newsletter Shortcode: You can add shortcode of mailchimp or other mailing applications. This plugin is used in demo. Overlay Type: You can select dark or light overlay of this section or hide it from here. Background Image: If image added here it will be used as background of this section. This widget is use to list services on home page. 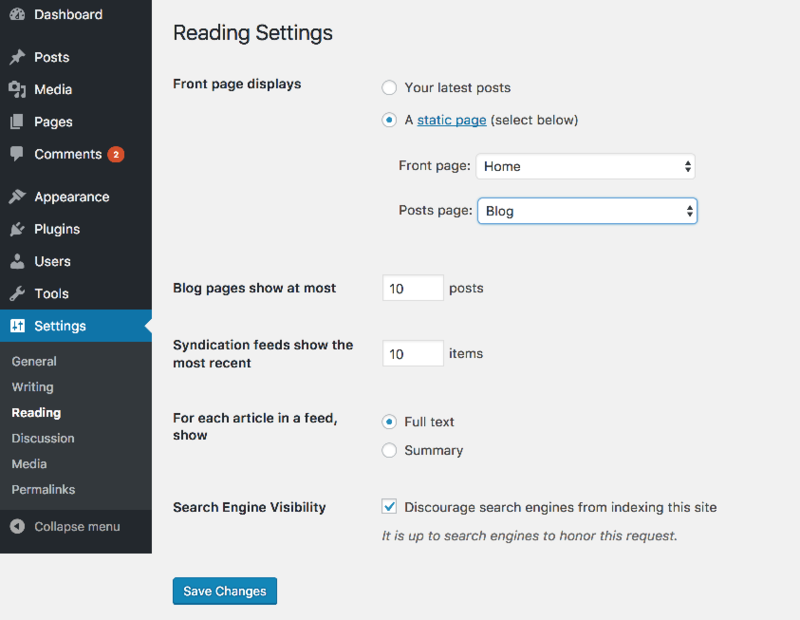 This widget includes, service pages selection, excerpt length, read more link to detail page and more. Title: Title for services section. Excerpt Length: It controls the length of description listed as services. Read More Text: Button text below each services. You can leave it empty if you wish to hide link to detail page. Pages: You can select the pages for service list. This widget is useful to create social links on the widget area. Set the social menus, that menu will appear with the help of this widget. In the above section, we already discussed about how to create social menu.